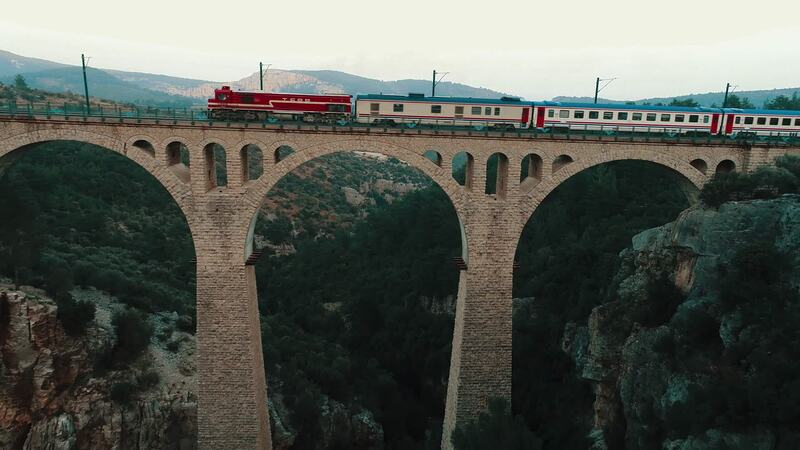 Check out this amazing drone video of a famous train viaduct in southern Turkey. The Varda Viaduct (sometimes known as the Giaour Dere Viaduct) is located in the Adana province. It was designed by German engineers as part of the Bagdad Railway project which helped to solidify Turkey's ties with Germany prior to World War I. Famously, the viaduct was the filming location for an epic chase scene which opened the 2012 James Bond movie Skyfall, the 25th installment in the series. Description: Varda Viaduct that appears on openning scene of James Bond Skyfall movie (2012). The Varda Viaduct (Turkish: Varda Köprüsü), aka Giaour Dere Viaduct, locally known as "Alman Köprüsü" or "Koca Köprü" (literally: German Viaduct or Big Viaduct), is a railway viaduct situated at Hacıkırı (Kıralan) village in Karaisalı district of Adana Province in southern Turkey. Designed and built by Imperial German engineers as part of the Baghdad Railway (Haydarpaşa Terminal, Istanbul-Baghdad), the stone arch structure is 63 km (39 mi) from Adana Central Station and 306 km (190 mi) from Konya.